I'm Steve Suffet and I call myself an old fashioned folksinger. I was born in 1947 and I've been singing as far back as I can remember. My Mom was a jazz singer, a pretty good one, and she played the ukulele. She couldn't stand what she called "hillbilly music," so rebel that I was, when I was a young kid I used to insist on listening to Tennessee Ernie Ford sing Sixteen Tons. Around the same time I got a harmonica as a gift and I used to go around tooting it just to annoy people. I eventually learned to play a few simple tunes, like Oh, Susannah and When the Saints Go Marching In, and that drove everyone even crazier. My Mom showed me a few chords on the ukulele, but I really never got into it. However, when I was in high school I spent $17 and bought a Harmony Stella guitar. 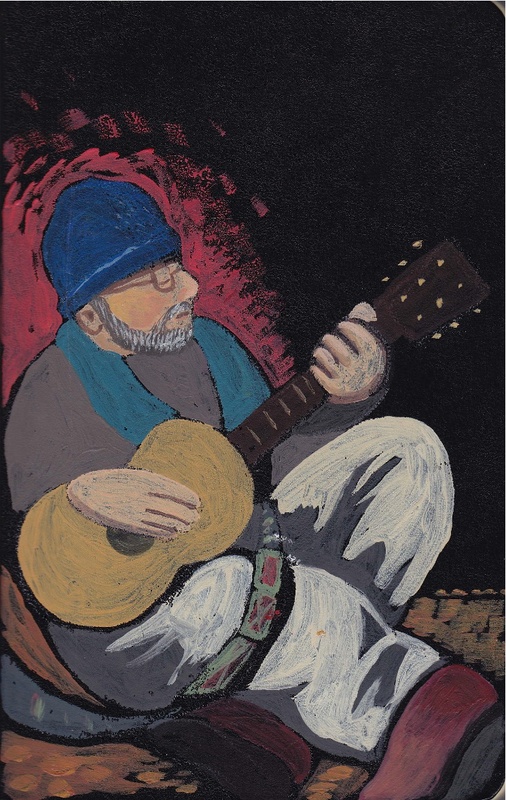 For another $2 I bought a copy of Jerry Silverman's Beginning the Folk Guitar, and from then on I was completely hooked. I started hanging out around the fountain in New York City's Washington Square Park on warm Sunday afternoons, and I tried to absorb everything I heard, including blues, bluegrass, ragtime, ballads, cowboy songs, hobo songs, union songs, topical-political songs, whatever. I took old Folkways records out of the library and then started buying my own. In a year or two I got my courage up to start performing at open stage nights -- hootenannies they were called then -- at various clubs and coffee houses. My God, was I awful! But I certainly learned a lot, and I even met some fellow musicians whom I still know today. Now the stuff I do I call folk music, but if you would rather call it roots music, or traditional music, or old time music, or even hillbilly music, that's OK with me. Essentially what I do is take any song I like, from whatever source, and sing it in a manner that suits me. Sometimes I change the tune a little bit, and sometimes I change the words. More and more I find that I'm making up my own songs. In fact, the well respected songwriter Si Kahn once said to me, "You write really good songs." I certainly am not about to argue with Si's assessment, but I'm still reluctant to think of myself as a songwriter. Old fashioned folksinger suits me just fine! For a complete listing of my upcoming performances, please click here! although I still participate in sing-arounds, round robin concerts, and workshops. in Woodside, Queens, New York 11377. You are welcome to bring some songs to share. Compact discs: My four CDs can be ordered on-line from CD Baby for just $10 each plus shipping. Please click here for more information. In addition, the first three are available in the United Kingdom from Four Dogs Music. Please click here for their website. My Live Performances CD, an album of 15 songs recorded before live audiences the USA, Israel, and the UK, is available exclusively from CD Baby. Click here for complete information. Digital albums: In addition to my CDs, I put together two albums, Old Fashioned Folksinger and Folksinger's Fancy, that are available only as digital downloads from CD Baby. Please click here for more information. Individual tracks are available from CD Baby, Amazon, or iTunes for just 99¢ each. I am proud to be a member of Local 1000, American Federation of Musicians, AFL-CIO. very much in the vein of Woody Guthrie et al. -- Mike Newman, Four Dogs Music, Felinfach, Wales. accessible and relevant but also suitably thought-provoking where required. -- David Kidman, Black Swan Folk Club, York, England. Link to schedule of Steve Suffet's upcoming performances. Link to Steve Suffet's musical biography. Link to Steve Suffet's MP3 files. Link to YouTube videos of Steve Suffet's live performances. Link to Steve Suffet and others performing in the 2018 Woody Guthrie Brooklyn Hoot. Link to Steve Suffet's Facebook musician's page. Link to Steve Suffet's photo gallery. Link to Anne Price's website. Anne is often Steve's musical partner. Link to page with some of Steve Suffet's musical friends. Link to MacDougal Street Rent Party webpage. Link to page with festivals, organizations, and venues. Link to tribute page for Eric Levine (1957-2008). Link to annual Woody Guthrie Birthday Bash (2001-2012). Link to review of Steve Suffet's CD Low Rent District. Send an e-mail to Steve Suffet. Joel Landy's Songs of Freedom cable TV program.